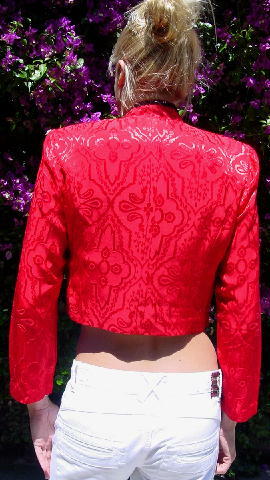 This bright red Asian style evening jacket is 55% rayon and 45% acetate (with a combo of 60% acetate and 40% rayon). 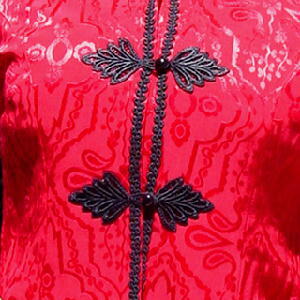 It has a tone-on-tone pattern with modified frog closures, black embroidery, and round black buttons. The front has 2 clear buttons and 2 black snaps, all of which are hidden. There are shoulder pads and a black piping around the collar and down both front sides. The back is 2 3/8" shorter than the front tips. The tag says 6 petite. shoulder to shoulder 15 5/8"
shoulder to hem 16 1/2"